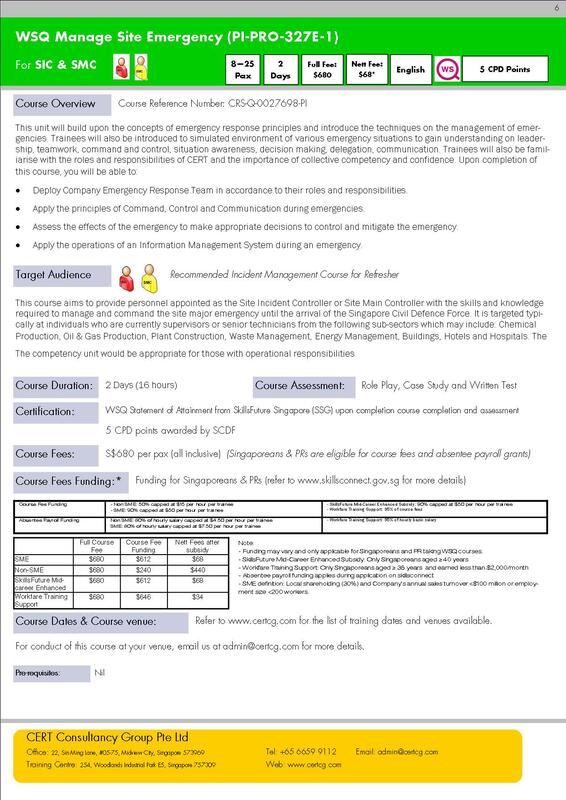 Full Course Fees: S$680 per pax (all inclusive). Lunch and refreshments are provided in this training. Singaporeans and PRs are eligible for funding. *Funding may vary, please refer to www.skillsconnect.gov.sg for more details. - A WSQ Statement of Attainment (SOA) from SkillsFuture Singapore (WDA) will be awarded upon the course completion. - 5 CPD points accredited by SCDF will be awarded upon the course completion. It is recommended that you had attended the first module “WSQ Implement Incident Management Processes” previously.